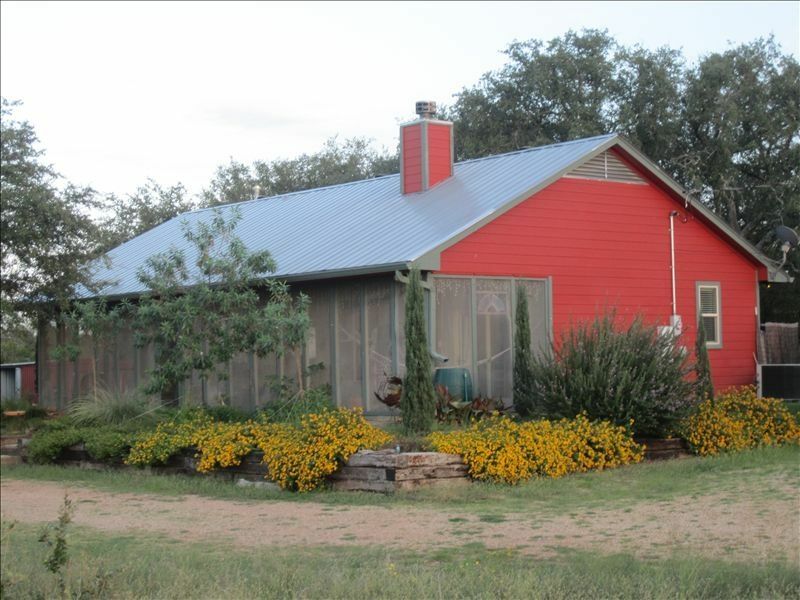 Located just 11 miles from Llano on 300 feet of private Llano River frontage, this updated 3 bedroom, 2 bath home situated on 10 acres has all the conveniences. Mornings are heavenly on the 500 sq. foot screened porch while enjoying your coffee, watching the birds at the feeders, and taking in the river view. Walk down to the river and enjoy deep swimming holes, great fishing, or just relaxing. The den has plenty of comfortable seating to enjoy your book, a Bose ipod docking station to enjoy your your music and a 42" flat screen TV/DVD for movies or football-Directv network. On chilly nights light up the wood burning fireplace-gas starter-and kick back until it is time to retire to the bedroom. Master has a tempurpedic king bed, 32" flat screen TV and private bath. Second bedroom has a king size bed and third bedroom has a queen size bed. These two bedrooms share a full bath. Downtown Llano is 11 miles away, Fredricksburg is 30 minutes away, Enchanted Rock is 20 minutes away, but you may never want to leave this cozy, private retreat.. Please see our website, www.riodelooney.com for additional pictures. Towels for the house are provided. We ask that you bring your own towels for swimming at the river. The kitchen is fully stocked with all that you would need in a home. Dishes - service for 10 people Plenty of coffee mugs salad plates, bowls, serving bowls and utensils. Two flat screen televisions. One located in the living room and the other in Master Bedroom. With ample notification, a Massage Therapist can be booked to do on site massages. There is nothing more you need from life than some time away at this beautiful house on the most breathtaking land in Texas! Beautiful house and property! Was just like expected and more so! We loved our time at Rio de Looney!! It’s the perfect getaway for peace and quiet! We’re planning another trip back! Our family loves visiting Rio de Looney! The home is always clean and always well stocked. Karen has always been helpful and feels like family now! Only stayed for two nights but just what we were looking for! So nice spending the afternoon swimming in the river after a hot morning of climbing Enchanted Rock. Wonderfully secluded and great river front. Plenty of seating for everyone by the river, on the porch and inside the house. Beds were super comfortable and house stocked nicely with paper goods. Birds on the feeders were a bonus. Would definitely rent again if we were visiting this area. This is a magical getaway in Llano! It’s a very spacious home with a well stocked kitchen for those interested in cooking. The screened in porch is a lovely spot for morning coffee with beautiful views and peaceful bird chirping. The kids loved the ping pong table! The river is just a short walk, and it is a wonderful swimming spot! And if you’re into grilling, there is a smoker and a charcoal grill, so don’t forget to bring briquettes. If you’re able to make it during wildflower season, the property is a colorful joy. Also, there is a side porch with a fire pit, just perfect for a sunset nightcap. Best place on the planet. Awe Sandra, you’re the BEST!